Thanks to everyone who Joined Tonight's Break. Breakis Scheduled for Friday Dec 15th @ 7pm EST this is a Rough estimated start time if break isn't full by this Date/Time it will Break when Full! 1x FREE SPOT *To Be Random Between all 29 Spots. 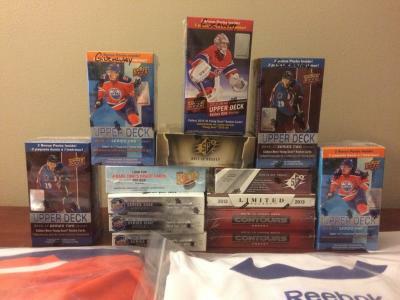 ^^These Giveaways will be a SCF Exclusive Giveaway's and will be Random between Breaks #276 & #277A/B^^ Each Team/Spot in these Breaks will receive 1x Entry per spot/Team. Random will be number that comes up on 2x 6 sided dice. Connor McDavid Edmonton Oilers Autographed Blue Reebok Premier Hockey Jersey Member Appreciation GIVEAWAY! You will get 1 Entry into the Member Appreciation Giveaway per each Team/Spot bought. We offer FREE Worldwide Standard Shipping & All Prices are in Canadian Currency. Between the 2x 6 Sided dice that we roll the total has to equal 5 or more.that will be amount of times we Random the Names/Participants &Teams. Earn one Transaction per Break * Post the Trade in the Trade manager and we will happily Accept it..
We look forward to seeing you in our next Break! We Broadcast Live onWednesdays & Fridays @7pm EST, Also on Release Nights! -8000+ online Transactions and 100% Feedback. Comment for your spots in this Thread. First Come First Served. Last edited by SportsCardCollective; 12-26-2017 at 09:00 PM. #17, and #27 for me. I'm watching, but not signed in. Perfect thanks. Welcome to my Breaks. Giving this a helping bump!! Let's fill this! Does anybody else here want in on this break? Just let Ryan know, and he will get you in! Welcome to my breaks. Thanks for joining.